Recently I loaded up on a lot of lemongrass. I typically do this when I frequent an Asian market and batch it out when I get back home. I typically trim the lemongrass and put it in freezer safe containers to be used later. 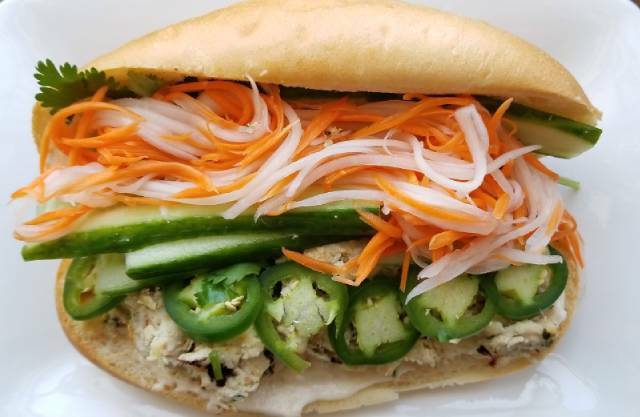 This time around though I saved about four stalks and decided to come up with a Vietnamese style chicken meatloaf to be used in a banh mi that I was craving. Start by making the pickled carrots and daikon. Set the vinegar, water, salt, and sugar in a pot and bring to a simmer. Turn off the heat and let the salt and sugar dissolve. Once cooled add the shredded carrots and daikon to a mason jar or sealable bowl, and pour in the liquid. Cover, shake, and place in the refrigerator for up to one week. Next, you can either grind your own chicken, which I did, or use ground chicken. Whatever you chose, add the mixture to a large bowl. To a separate bowl add the bread and top with milk. This is your panade, the secret to moist loaves of meat. Thank me later. To a blender or food processor, you are now going to breakdown that lemongrass. It’s fibrous so you want to break it down into as much of a paste as you can. This may take a few minutes. Add the lemongrass, garlic, sugar, shallot, ginger, and onion to a food processor. Pulse and continue to pulse/blend until you have a smoother paste. Nothing too chunky. Scrape the mixture into the bowl of chicken, then add the fish sauce, soy sauce, eggs, and bread and milk mixture. Season with pepper. Get your hands in there and get mixing, much like you would do for meatballs or meatloaf. Form this into a bread pan. Let marinate overnight. Preheat the oven to 400 degrees. Cover the pan with aluminum foil and place in the preheated oven for 45 minutes or until the internal temperature of the meatloaf reaches 165. Get your banh mi ingredients ready. Heat a large skillet on medium heat. Add 1 tablespoon of canola oil and swirl it around. Cut one slice of the meatloaf and place it into the hot skillet. The goal is to get a nice sear on the loaf. During this time, lightly toast your bread. Lather mayonnaise on both top and bottom. Lay on the meatloaf. If it crumbles, which it may, it’s OK.
Add the jalapenos to your liking, the cucumber, pickled carrots and daikon, and the cucumbers. Fold everything in, tuck it in like a baby, open wide, and get to town. Where do I begin to describe the experience? Yes, it is an experience. It’s everything and more. It’s fresh, crunchy, powerful, funky, and just one hell of a great sandwich! I hope you enjoy, especially if you are not only looking for a new take on a ‘meatloaf’ but also a great sandwich. Have a great week everyone! make this a day ahead of time as I like to let the pickling work the carrots and daikon overnight, as well as letting the chicken take on all of those awesome flavors from the marinade. Your call, but overnight works really well.